West Broward Tint specializes in window tinting and they can help you with any type of window tint in Coral Springs, Fort Lauderdale, Pembroke Pines, Pompano Beach, Sunrise FL or Weston. The can tint your car, your boat, your home or your commercial building. They also operate a mobile tinting service, so they can come to you to tint your car or bus. Window tint offers several benefits. Aesthetics is an important benefit of window tinting. A window tint can add curb appeal to your home and make your car or boat appear more stylish. It just looks cool and awesome. Tint film has one-way properties, so it provides greater privacy. You can to the outside, but outsiders can’t see in. Now that is cool. Window tint film is an inexpensive and attractive way to improve the comfort of interior space. Because it absorbs or reflects heat, it keeps interior spaces cooler and more comfortable. Other benefits of window tint include glare reduction, UV reduction and energy efficiency. Window tint helps keep the interior of your home or vehicle cooler. This adds to your comfort and helps with energy efficiency. Safety through glare reduction and increased window strength are also important benefits. The benefits you get from window tinting also depends on the type of tint film. You get dyed window tint film, metallized film, carbon window tint film and ceramic film. A professional installer such as West Broward will provide you with the options and explain the pros and cons of each. For example ceramic tint film is high quality that absorb the most solar heat while still providing maximum visibility. It also allows maximum efficiency when it comes to devices operated inside a tinted space. Coral Springs, Fort Lauderdale, Pembroke Pines, Pompano Beach, Sunrise FL or Weston. Window tinting is what they and all they do – that is why they so good at it. They also provide a mobile tint service which means they can come to you to do your car window tinting. Car window tinting is more in demand than ever before and for good reasons. 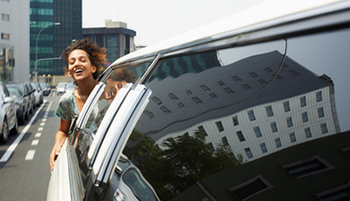 Auto tint improves your comfort and safety while driving. Tint film block heat from the sun which helps to keep the interior of your vehicle cool and comfortable. Tint firm also reduces glare from reflect light as well as glare from approaching head lights. In addition tint film absorbs harmful UV rays which helps protect the interior of your vehicle. Since tint film offers a one-way view, you can still see out, but other can see in. You experience greater privacy. Those are all good reasons to consider car window tint, but they not the only ones. Aesthetics is another important reason to consider car window tinting. Tinted windows look cool. Car window tinting can make your ride look more stylish. It is another form of self-expression and an extension of your personality. Window tint can also make you boat or house look more attractive and stylish. Car window tinting is affordable. It also does not take long to complete an auto tint. So it makes sense to have your car windows tinted. You can also extend window tinting to your home, office or boat. At West Broward they can help you with commercial and private window tinting. They can tint you car, your bus, your home, your boat or your commercial building. A home is not just a place where you store your belongings and go to sleep at night. It is a place of shelter, relaxation, and security. So, you must take all the efforts to protect your home from all kinds of risks. One such terrible damage that your home is exposed especially during the scorching summer is the sunlight. The sun can totally destroy your overall comfort in the house. And you cannot keep your home windows closed all the time. Isn’t it? So, you need to think of an effective solution for this problem. That is why, we, at West Broward Window Tinting, bring you high-quality home window tint in and around areas like Coral Springs, Fort Lauderdale, Pembroke Pines, Pompano Beach, Sunrise FL, and Weston. Create a well-protected and comfortable living environment with us. With more than 2 decades of experience in this business, we have catered to the needs of several families, protecting their furniture, floor, window coverings, and treatments, along with reducing their energy bills and property maintenance costs. If you are still confused as to whether you should opt for a company like this or not, then here we have a few reasons that you need to know. Take a look. Window tinting will block about 80 percent of the solar heat that usually enters your rooms through the windows. This eases the burden from your cooling systems and reduces your energy costs, helping you to maintain a more balanced temperature in the whole room, and that too without blocking the view. Ultraviolet rays from the sun could cause a huge damage to the floors, blinds, curtains, furnishing, artwork, along with other belongings in the room. Since the window tint can block these rays, you will get lesser glares, thereby protecting your property effectively. And along with this, you will also get better privacy at home without having to close the windows or draw the curtains. So, quickly call us at 754-234-1890 now for quality home window tints.